Edited 08 Sept 2012 to add more pictures of the brake assembly. 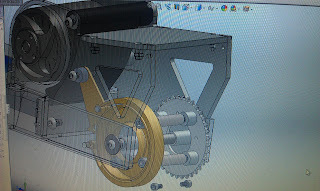 Due to the failure of the caliper brakes I redesigned the brakes to use band brakes. These brakes work by tightening a band of braking material around a rotating drum. 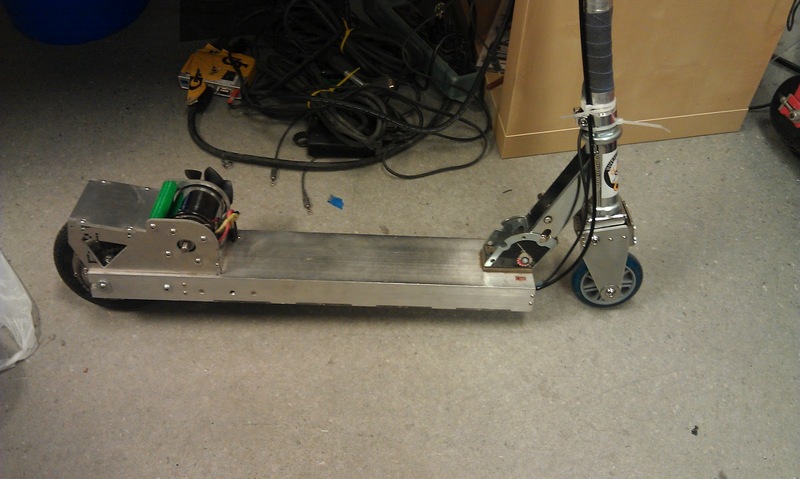 The caveat is that they don't fit on the front wheel, so they have to be placed on the back wheel. While it does eliminate the possibility of going over the handlebars through overzealous braking, it does significantly reduce braking force, something I'm not pleased about. Danger of going over the handlebars can be eliminated through practice. Maximum rear wheel braking force will never change. Cramming brakes onto the back wheel in addition to the sprocket was a mess. 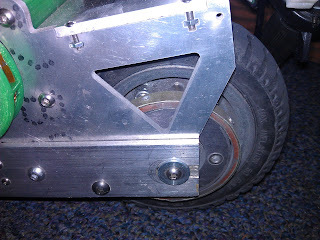 Thankfully, I was able to use the existing bolts going through the rear wheel to also attach the brake drum. 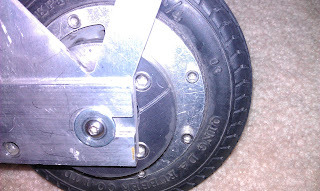 The brake band was attached to the side of the motorpod, which was redesigned to include a back footrest. This made my ghetto extended fender obsolete. It worked enough to survive a couple rides in the rain. 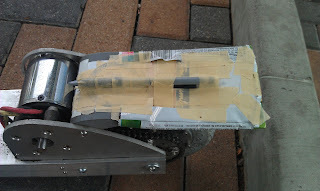 The new motorpod used the existing mounting points as the old one, so it worked pretty well. Apologies for pictures of the screen, my internet wasn't functional at the time. 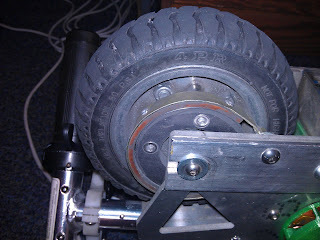 Showing the bolts that go through the entire wheel, connecting the hub and sprocket. The existing 70mm brake hub had a couple holes that almost fit the existing holes. However, after tightening the screws on the wheel, the hub distorted. 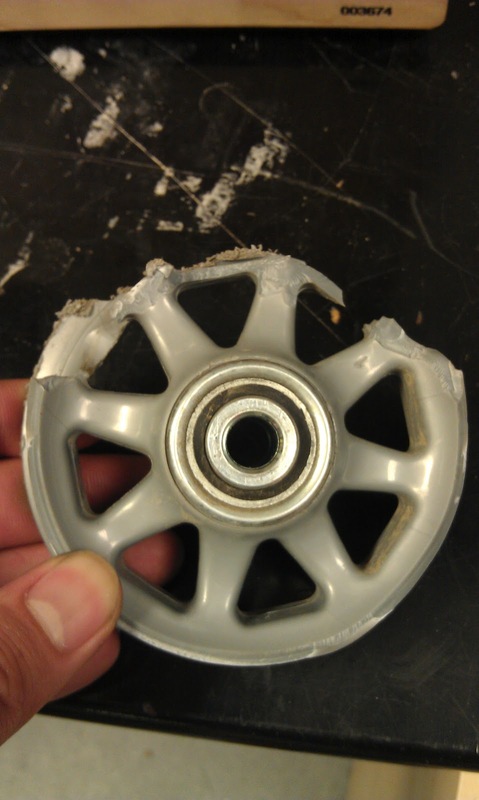 While it was still usable, it made braking force highly inconsistent. It was either little braking or locked up wheel. 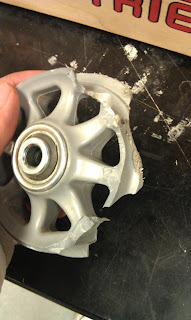 Thus, I made a new hub from a scrap hunk of aluminum. I love the countersink look. With this new, significantly more concentric brake hub, the brakes work fantastically. The entire motorpod. The brake band was removed for disassembly so it'll fit in a suitcase. 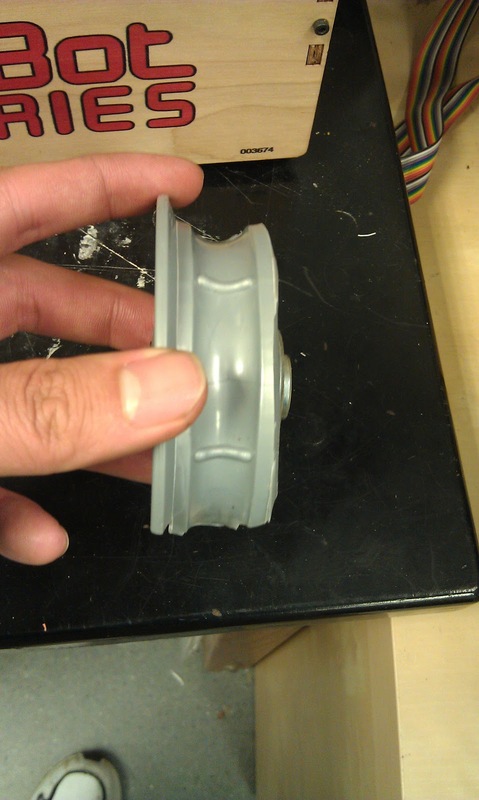 With the brake band. 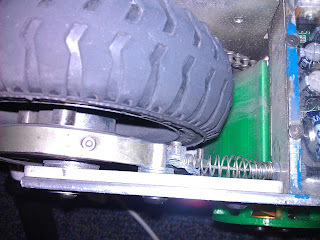 The wheel is changed because the previous one had a flat was a real pain to remove the inner tube. Showing the end of the bowden cable. While at Tech, I had a little accident. When the manufacturer warned the wheels I used were not designed for motorized applications, they meant it. The rim on one side is completely gone. The impact from falling on the hub smashed it up. Luckily I came out of it with only scrapes and sprains. 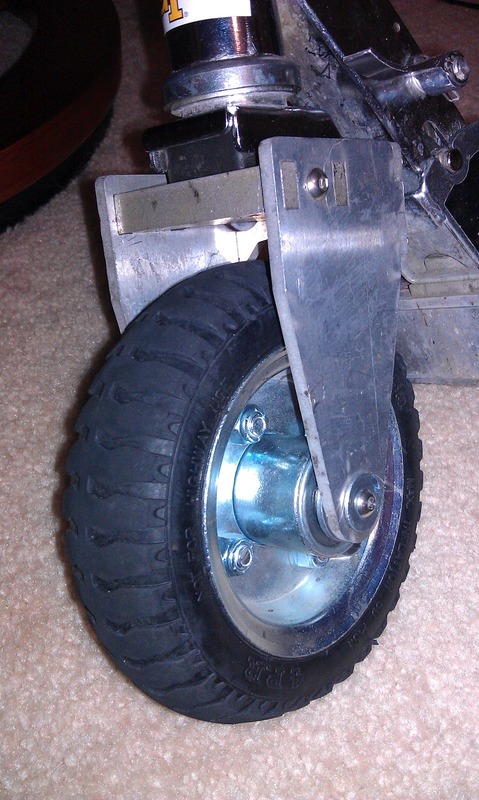 Learning from my mistakes I changed to a 6 inch steel hub pneumatic wheel (McMaster part number 2717T41). 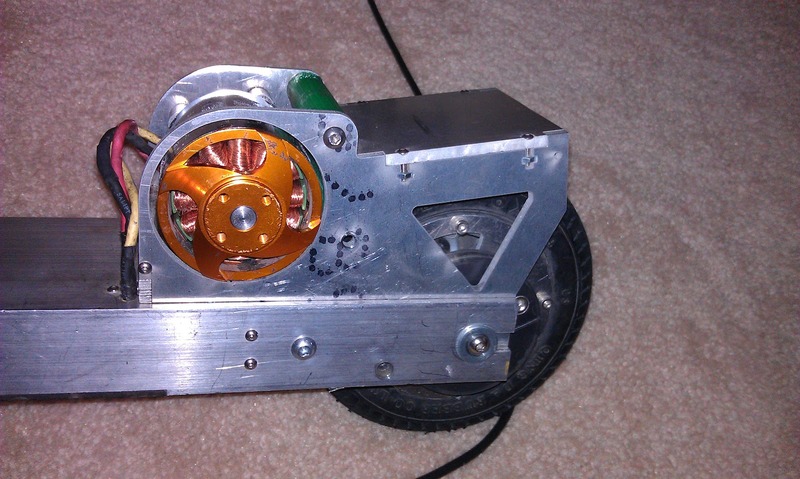 This wheel had already proven itself for the Velociryder. 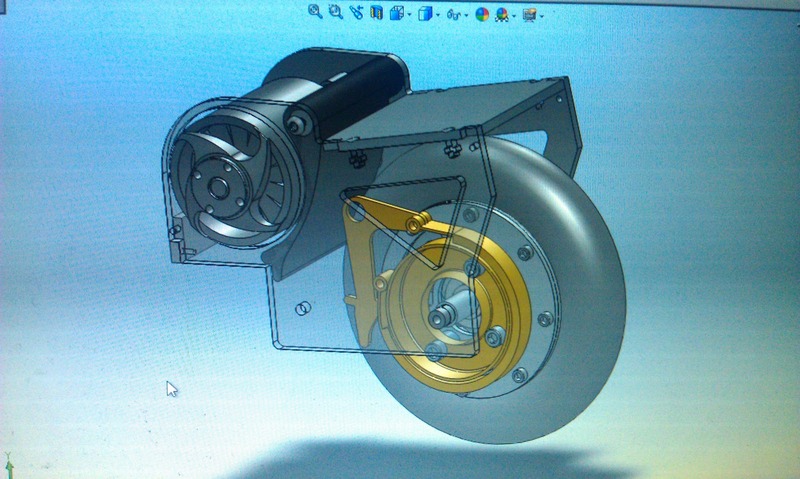 Of course, this meant redesigning the front fork to fit the wider wheel. While making a new front fork I needed to quickly hack a usable front fork. 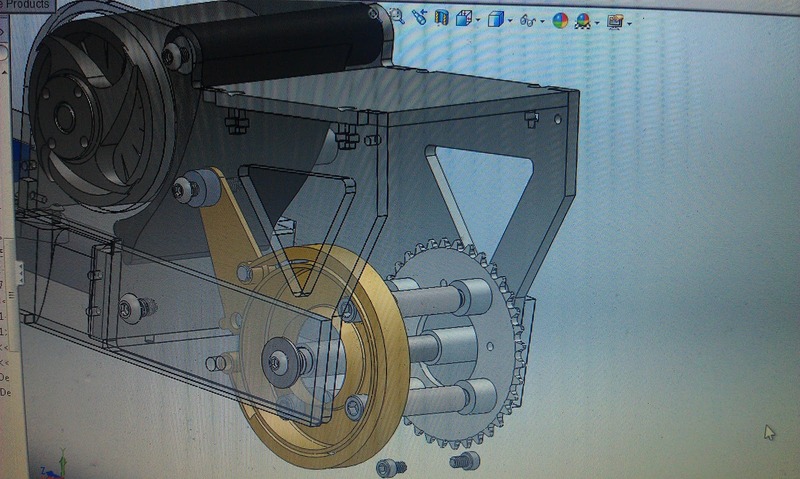 Solidworks and waterjet and annoying milling of steel later is a new front fork. Three days before the end of my internship the chain stretch in my scooter reached a breaking point. After stretching nearly a half link, or 1/4", the chain no longer stays on the sprocket. Time to cut slots to take up the slack and lubricate the chain to keep it from stretching so quickly.